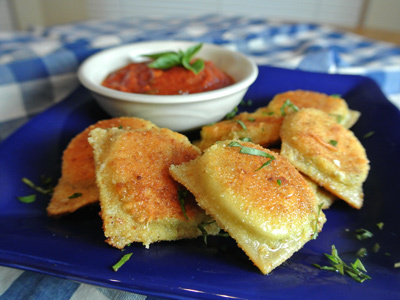 If you go to the trouble to make ravioli from scratch, it’s a must to set aside some to make toasted ravioli. It’s really simple to put together and pan fries in minutes for a quick meal. 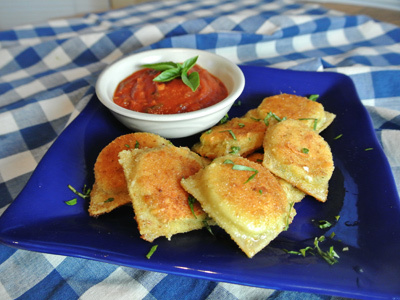 Using thawed ravioli, these pasta squares cook up crisp while trapping the gooey cheese inside the shell. All that’s needed is a tasty pasta sauce. 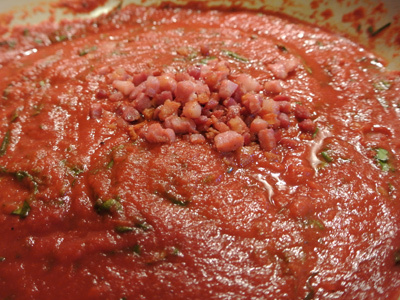 I tried out a new recipe for a tomato based sauce with pancetta and herbs. It’s must have tasted pretty good because the guys devoured them in no time. Starting with the sauce I added 3 ounces of pancetta to a large saucepan. Fry over medium high heat for several minutes stirring occasionally. When it begins to crisp and brown, remove from the pan. 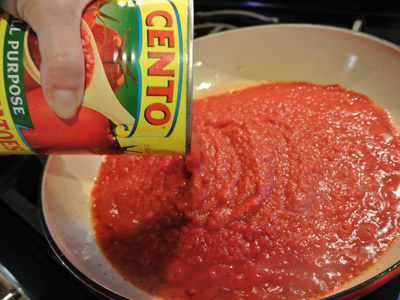 In the same pan over medium heat, add a large can of crushed tomatoes. 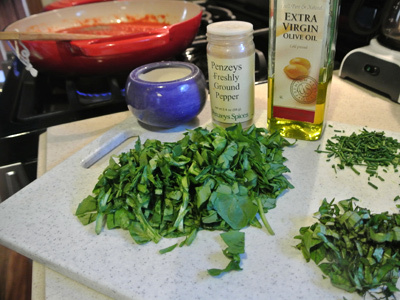 Finely chop some basil, chives and spinach. Season with salt, pepper and olive oil. Add the herbs and seasonings, stir the sauce and simmer for a couple minutes. 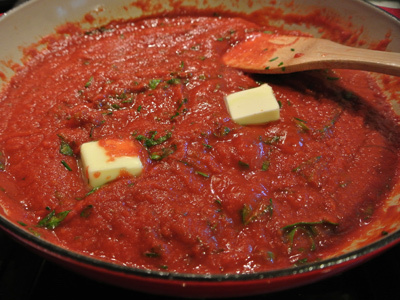 Melt 2 tablespoons of butter in with the sauce. 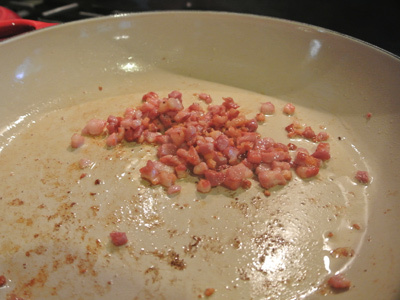 When melted, add the pancetta back into the sauce. If you are making your ravioli now, turn down the heat and let simmer on low. Time to get the coating ready for the ravioli. I started with an egg but had to add another with a the second batch. Also needed is some bread crumbs, parmesan cheese, salt and pepper. 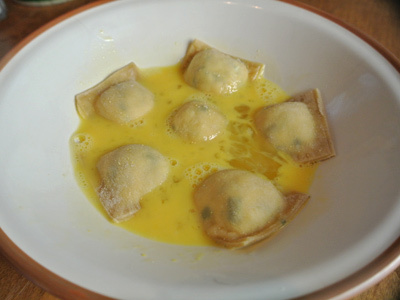 Whisk the egg and start adding the ravioli, coating on both sides. Next, move them over to the bread crumb mixture to coat both sides. Add enough olive oil to coat the bottom of a large non-stick pan. My big pan will hold 12 ravioli at a time which makes it convenient. Turn the heat up to medium high. 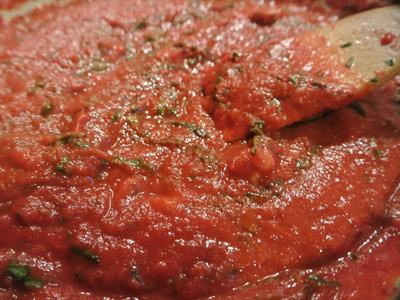 When the oil is hot, start adding the ravioli. In just a minute they should be getting crisp and brown and ready to turn. Gently flip them over to cook the other side. These cook quickly and may only need a minute or so before they are ready to come out. Drain on a paper towel before serving. Serve them up with a little sauce on the side for dipping. 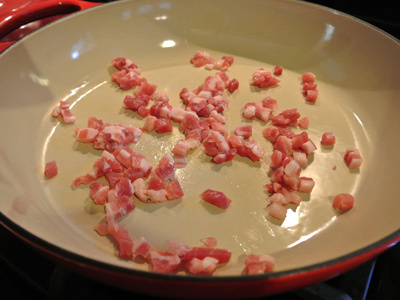 In a large saucepan over medium high heat, add the pancetta and cook until crispy, 4 – 5 minutes. Drain on a paper towel and set aside. 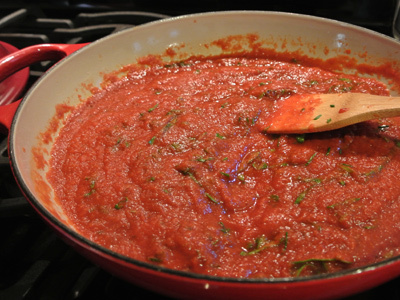 Add the tomatoes to the same pan along with the spinach, basil and chives. Add in the olive oil, salt and pepper. Stir for 2 minutes until the herbs have wilted. Stir in the butter and simmer until melted. Add the pancetta back into the sauce and stir. 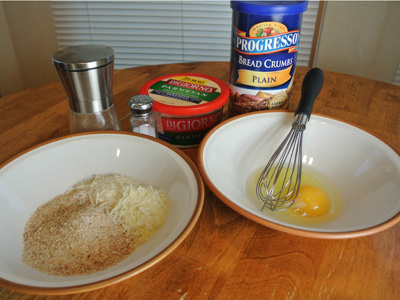 Whisk eggs in a medium bowl. 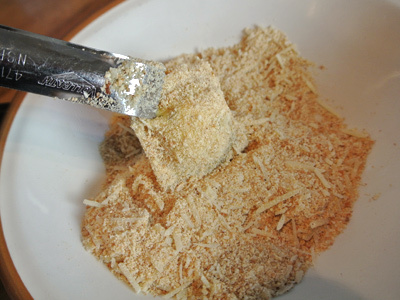 Combine bread crumbs, parmesan cheese, salt and pepper in another bowl. Coat ravioli first in the egg wash, then in the crumb mixture. Heat non-stick skillet over medium high heat and add enough olive oil to coat the bottom of the pan. 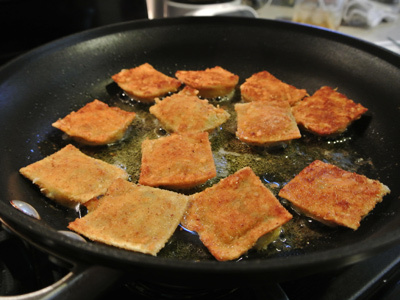 Add the ravioli single layer in the hot oil and fry about 1 minute or until it has become crisp and browned. 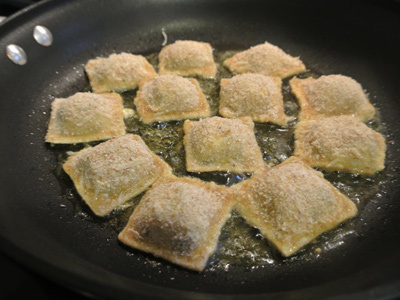 Turn ravioli over to cook the other side and additional 1 – 2 minutes. Drain on paper towels. If needed, add additional oil to fry the next batch. Serve with pasta sauce. I’m Jan Cook and I love to cook. I’m hoping that this site will be a place to post and share some of my favorite recipes with family and friends. 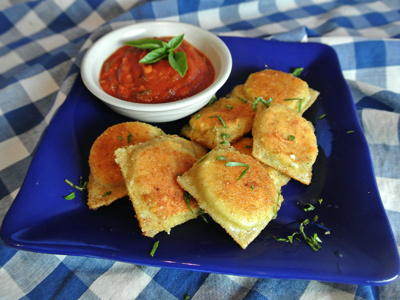 I’ve never tried toasted ravioli. Sounds intriguing! Some would say it’s more of an appetizer. The crispy texture is a real treat dipped in pasta sauce! I used to buy these at the market frozen. So glad I can make these at home now. Delicious!